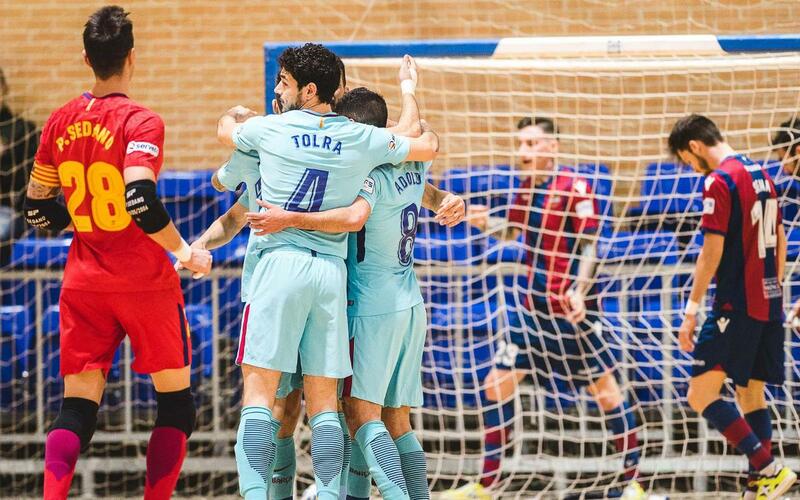 Barça Lassa ended Levante's unbeaten home record of six games with a clear 9-3 win in El Cabanyal in week 26 of the LNFS. Two goals each from Esquerdinha, Adolfo and strikes from Rivillos, Ferrao and Rafa López plus two own goals were enough to put David Madrid's side to the sword. Levante took the lead early but that only served to awaken the beast in Barça Lassa and an attacking hurricane in the first half gave the visitors an 9-2 lead at the break. In the second half coach Plaza was able to rotate his squad, resting certain players and giving fringe players with some valuable playing time. The 9-3 win was the second of the season over Levante as the team from Valencia had lost 4-0 at the Palau earlier in the campaign.